640 x 280 version included as part of QuickTime samples. Get the latest QuickTimeTM software here! *we reserve the right to cancel and refund orders at any time Immerse yourself in the rich environmental rhythms and orchestral music that evoke the grand scale of this epic time travel adventure. 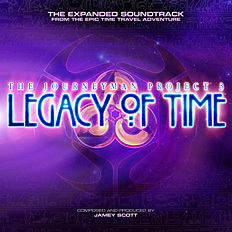 The original audio CD was released with 21 tracks in 1998, and a new expanded soundtrack with 31 tracks was released in January 2015.